The airfield at Kjeller, in Lillestrøm (just outside Oslo) is the oldest airfield in Norway, and in fact one of the oldest in the world. Originally built to house a small aircaft factory, the airfield is now used for general aviation purposes as well as heavy maintenance on the Royal Norwegian Air Force's (RNoAF) F-16 fleet. Kjeller is also home to more than twenty airworthy classic aircraft, ranging from a DeHavilland Chipmunk, to Saab Safirs, Tiger Moths and a T-6 Harvard. 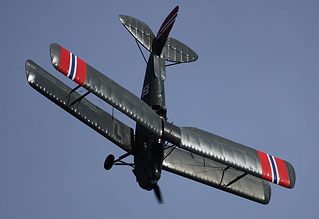 The annual airshow, called the "Kjeller Flydag", is held on a Sunday in late May every year and entry is free. Fredrik Edvardsen reports from Norway. Photos by the author. The 2010 edition of the Flydag took place on Sunday 30th May and for once the weather actually played ball, with sunny blue skies for most of the day, and more than 10,000 people finding their way to Lillestrøm and Kjeller. The static display was, as always, dominated by the different aircraft that call Kjeller their home; some flyable, some being restored to flying condition and some that will never fly again, including an ex-RNoAF F-104 Starfighter and a DH100 Vampire. Unfortunately the crowd line at Kjeller is less than ideal for anyone who wants to take pictures of the flying displays, as you are facing the sun for most of the day, and some of the aircraft in the static display are parked in front of the crowd line. Fortunately though there is a perfectly good spot for photographers on the other side of the airfield. The day kicked off with a parachute drop from Dakota Norway's silver lady, which later on flew round trips along with several R-22 helicopters operated by HelikopterDrift. The Flydag tends to cater to anybody with an interest in aviation, boasting displays by everything from T-6 Harvards to F-16s, and this year was no different. As the wind tends to build up throughout the day, the first slots in the flying programme was reserved for light aircraft like the resident Tiger Moths, the PT-19 Cornell and the Saab Safirs. As the day progressed we were treated to spirited displays from Russian Warbirds of Norway's L-29 Delphin and Biltema's Spitfire XVI. An annual treat at the Flydag has always been the display by the two T-6 Harvards, usually together with Dakota Norway's DC-3, however this year one was grounded and the other one missed its slot due to other acts taking up more time than was planned, which was a shame. My favorite display of the day came from a rather unusual suspect, the resident Alouette. I have seen the Alouette's display once before and it still amazes me. The Extra 300, Extra 230 and Cap 10 displays were all well executed, but seing as they were all flown high above the airfield they really lacked the "punch" that you normally expect from aircraft like the Extra 300. A most welcome surprise this year was the addition of the RNoAF's newest aircraft, the C-130J, in the flying programme. The Hercules flew in from their home base at Gardermoen, which is just a stones throw away from Kjeller, and even though we weren't treated to a full display, it was still nice to see the C-130J in the air. 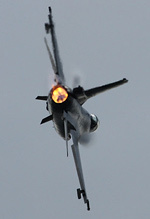 As the day drew to an end the unmistakable hissing of the F-16's engine filled the air as it taxiied out for its display. The F-16s displaying at Kjeller are usually put on static display early on and then towed down to the military part of the airfield before its flying display. Due to the fact that the RNoAF doesn't have a dedicated F-16 demo team, most Norwegian F-16 demos don't really show off what the jet is capable of. This was also the case this year as the demo only consisted of a couple of high speed passes, a high alpha pass and a few 360 degree turns. The real surprise this year was the inclusion of one full roll. All in all the 2010 Flydag was a great day out. Even though funding is limited they always manage to get a few star items on display, and I have to applaud the execution of this year's flying programme as there was something going on in the air at all times.